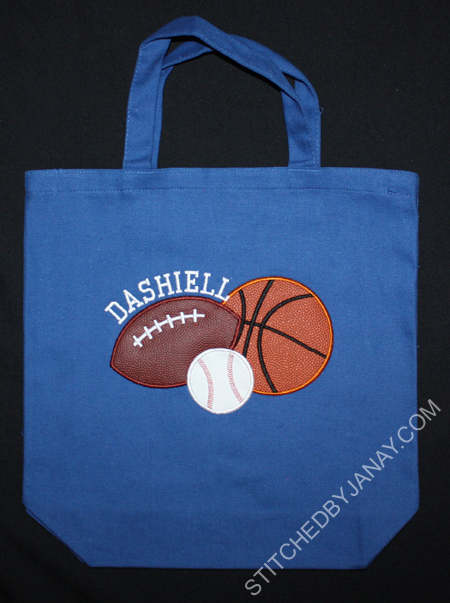 When I got done with Dashiell's tote bag using the sports ball vinyl, I did a google image search on sports balls applique designs -- just to see if there was something cool out there (that I didn't already have) that I could use on a shirt for him. And I stumbled upon this neat monogram! 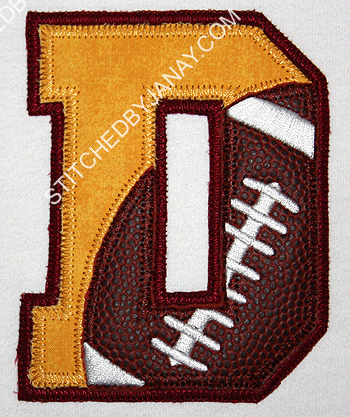 This football applique alphabet is from Starbird Stock Designs. I had never been to this site before, and still need to explore it some more. But I was so intrigued by the design (and enticed by the amazing sale) that I decided to buy the letter D design and stitch it out to see if I wanted to purchase the whole alphabet. I really like the results! 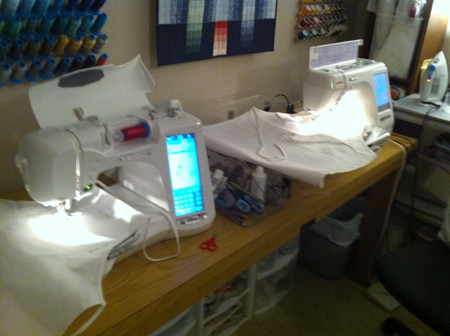 For those of you that do machine applique, here's a bit of advice/info. I had to do a bit of editing in my software. 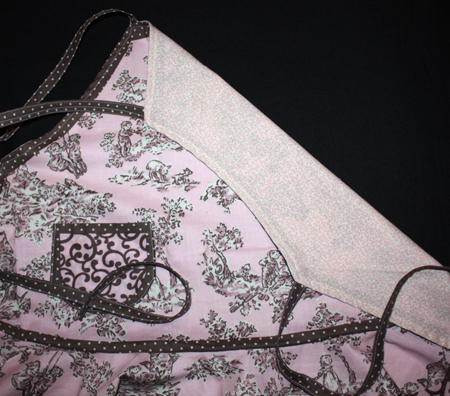 The die line is only stitched once, and then the zigzag stitch came next. So I duplicated the die line to have a placement and tackdown stitch. 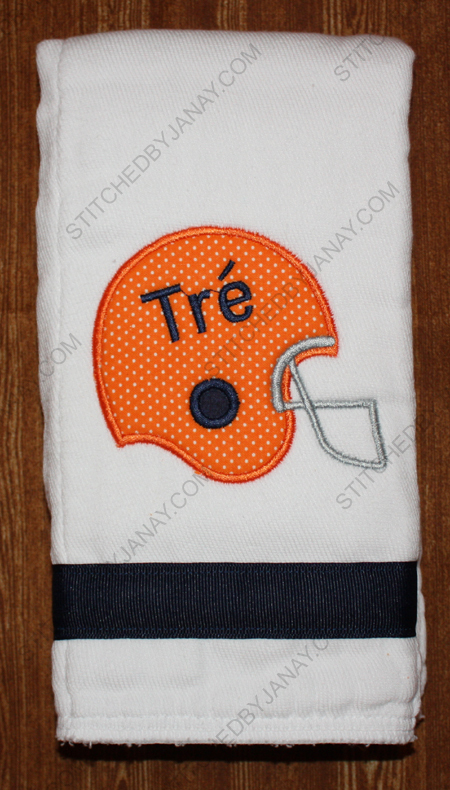 It does the background color first, then the accent color, then the football, and then the white stitching last. The vinyl did very well on this design! You will want to use HNBL on the fabrics since it's a zigzag stitch. 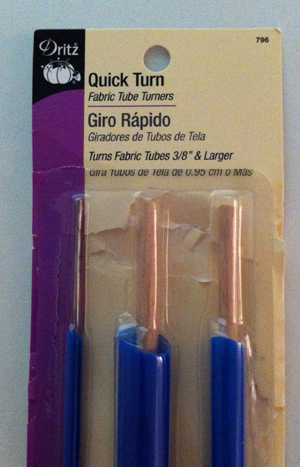 Actually this design kind of lends itself to felt -- may have to give that a whirl. And look at my pleased little boy! 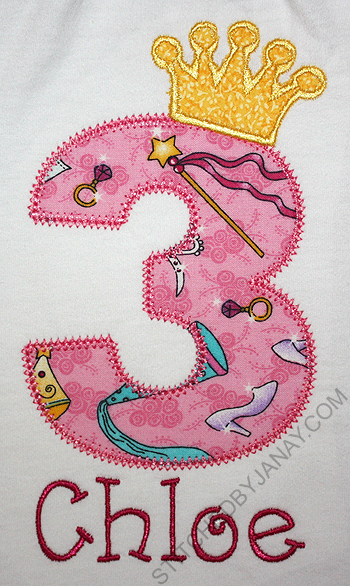 The set comes with both the alphabet and numbers, which I think would make awesome birthday shirts. 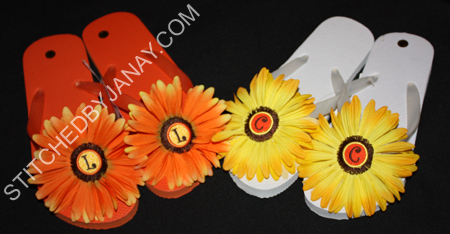 You can use whatever team colors you want, so it's super versatile, and you don't have to worry about any licensing issues! in our case GO NOLES! Let's see... how many weeks have we been in school? Dashiell has been using one of Annaliese's old preschool bags, even though I bought a tote bag to stitch something on for him before school started. I just couldn't get inspired for what to put on it. My goal was a school themed applique, but I wasn't in love with anything (for a boy). Then this week I decided it didn't have to be school themed, and I could use it as an opportunity to test out the new sports ball vinyl that my MIL bought for me!! Didn't this turn out cute?!? 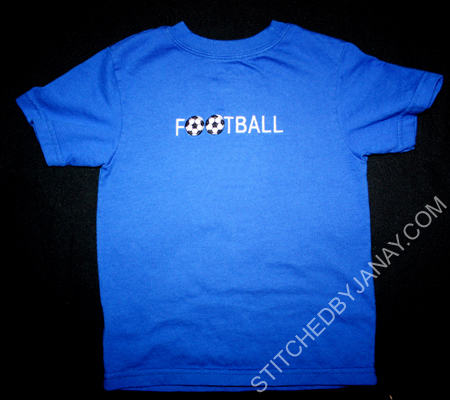 I used the Sportsballs Applique design from Planet Applique, although I deleted out the soccer ball. No offense to soccer lovers, I just wanted to simplify a bit and have space to add his name. I used the College Block Small alphabet from 8 Claws and a Paw to add "Dashiell". Ok, let me weigh in here on this vinyl. My MIL purchased a yard of each (as well as black) from 1st Impressions Designs and gave me half of it! It's pretty cool stuff! It cuts easier than I expected. 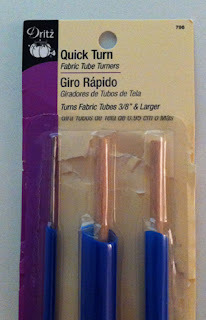 I used these applique scissors and they did great. 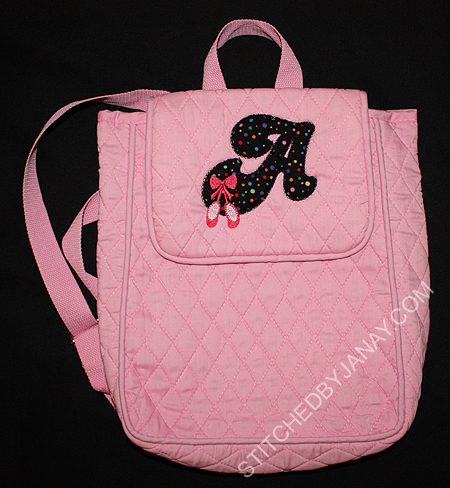 I had complete coverage with the satin stitches, no vinyl poking out. While I love the looks of this design, I would not recommend using vinyl with it. 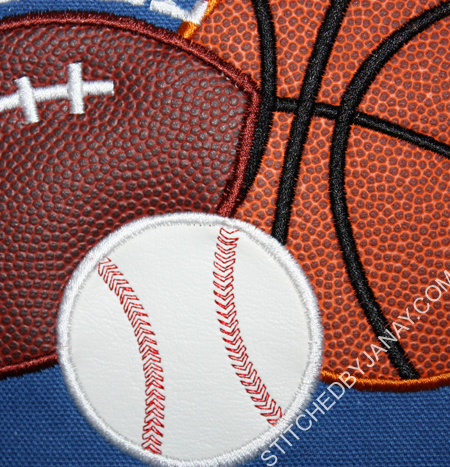 They way the tackdowns are digitized the balls overlap by about 1/4", which is no big deal when using regular cotton material, but vinyl makes it pretty thick right where the satin stitches need to go. 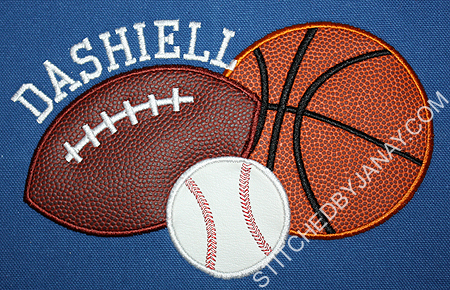 In fact I broke a needle, and there was about a 1" stretch on the football that my machine just would NOT do the satin stitches on, I had to do it manually with my sewing machine. Here's a close up for two reasons... first, look at the awesome texture of this vinyl! Second, see the top of the baseball where the right red stitching lines come out... the white satin stitches there are very narrow. 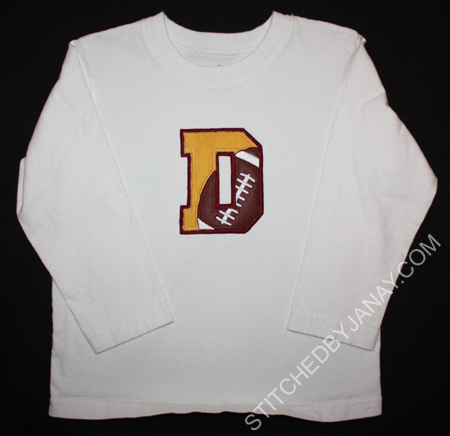 That's caused by three layers of vinyl and two layers of satin stitches BEFORE the white was stitched. YIKES! I was holding my breath with my finger on the stop button as it stitched across there! So... 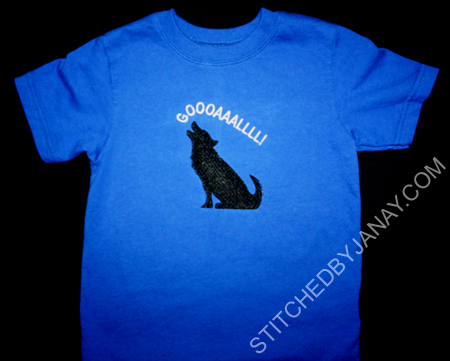 I will stitch this design again, but with cotton fabric. And I will definitely use the vinyl again, but on a design that doesn't have the ball fabrics overlap. 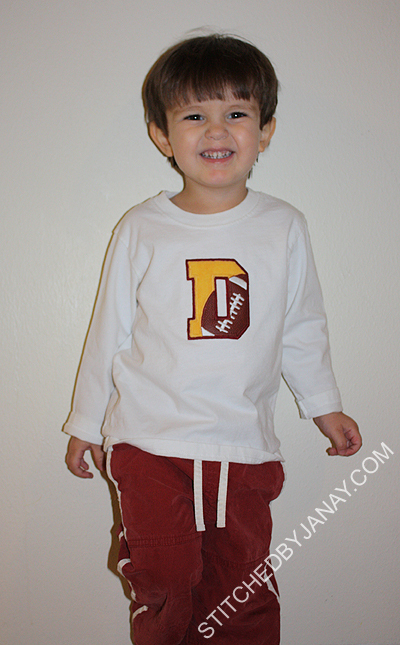 My next project with the vinyl will be a shirt for Dashiell -- I want to experiment with laundering it! 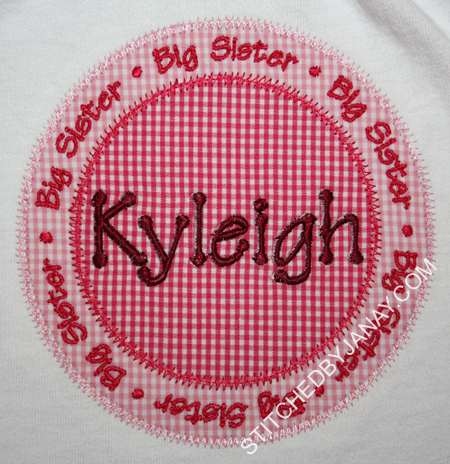 Michelle asked me to make a set of sibling shirts using the designs from Applique Momma. I was happy to oblige! 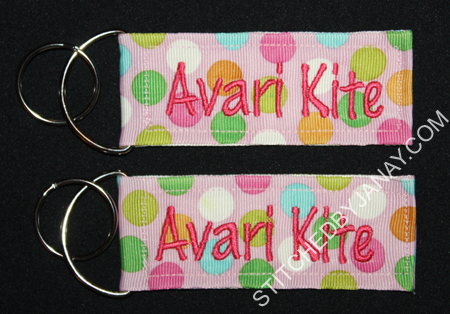 I used my new Fabric Finders gingham for these, inspired by a sample posted on AM's facebook page. 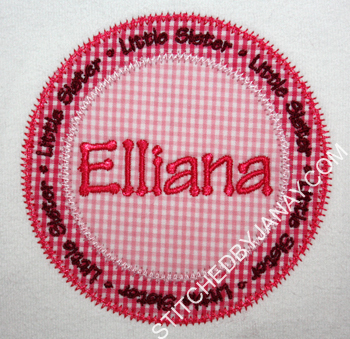 I used the zig zag 4" size of the Little Sister design for Elliana's shirt. We also experimented with switching the fabrics. I can't decide which I like better, but I definitely like the monochromatic look! 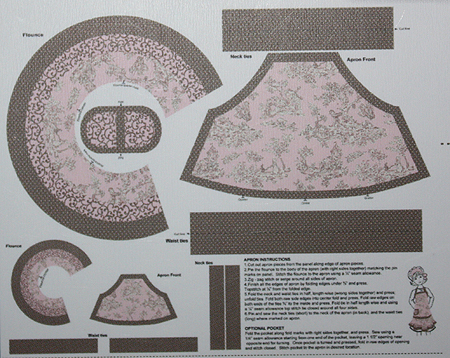 The fabric is very thin, and the directions called for serging edges, folding under 3/8" and top stitching. 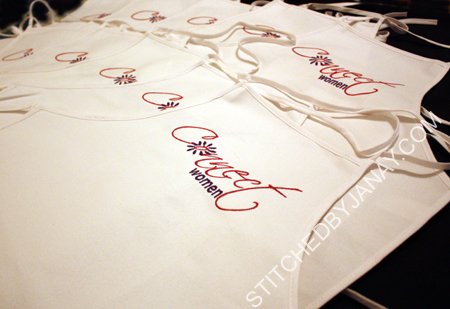 I was not thrilled with that idea, so I dug through my fabric stash and found something to line the entire apron. I'll be honest, I'm pretty proud of myself. :) I have very limited garment construction experience, and I definitely prefer to follow directions, so "winging it" isn't something I do often. I'm glad I had a tiny version to practice on first! 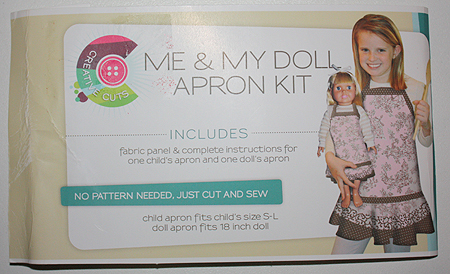 The doll apron turned out well, so I was safe to proceed onto Annaliese's, and her's turned out to be completely reversible (although the other side is boring and I doubt she'll wear it that way). This may shock you, but there is no embroidery on these... And I don't know if I'll monogram them. Probably not unless she asks me to. 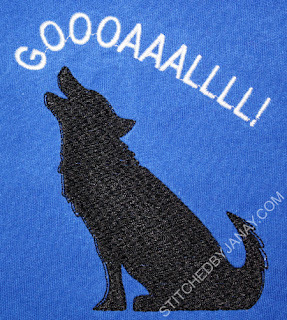 I searched high and low for a good embroidery design (applique or fill-stitch) of a sitting howling wolf. No luck! Found one, but it was on a site I had never purchased from, and it gave no info about the design (size, stitch count, thread changes) so I didn't really want to spend the money and discover it was not appropriate for this project. (Side note to digitizers -- please provide this info on your site!!!) Soooooo.... I asked Jason to send me an image of what he was visualizing, and I digitized the silhouette myself. 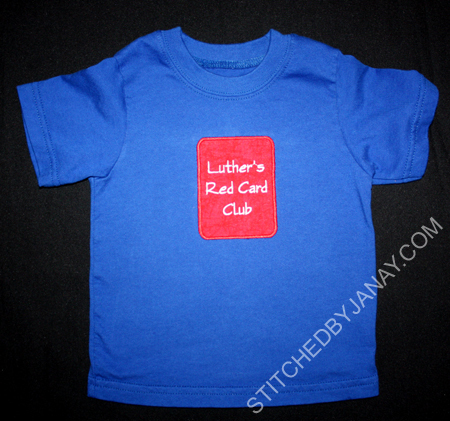 For the younger son's shirt, I digitized this rounded rectangle to look like a playing card and added the text (front and back) with Embird Alphabet #14. Jenn made it really easy on me this year -- she wanted me to reproduce a shirt I made in July, all I did was swap the name and changed the thread color to match this adorable tutu skirt she had purchased. If you compare, I even got the fabric placement virtually identical -- so proud of myself! ;) I used the Chubby Wubby applique numbers from GG Designs for the 3, added the crown with Applique Cafe's Add a Crown design and stitched her name with the Swirley font from 8 Claws and a Paw. Ok, I know I just posted a "miscellaneous projects" post and could have included this there, but I really like how this turned out and wanted to highlight it. :) Tracy asked me to make a burp cloth for her to give as a gift, requesting a lavender and light green color scheme. I acknowledge that this turned out to be more purple than lavender, but we both really liked the ribbon. I've had it in my stash for a long time, but I think this is the first time I've actually used it! And I absolutely LOVE this monogram/font combination. 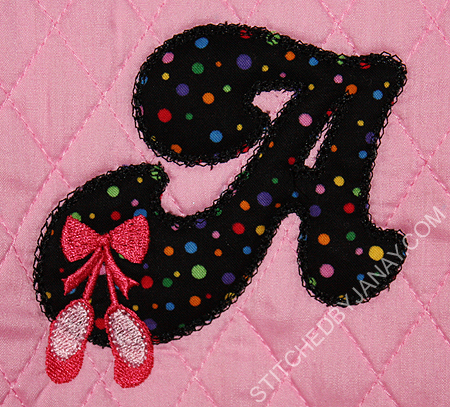 The "E" is Lynnie Pinnie's Applique Swirl Font. I added Emma with Swirley from 8 Claws and a Paw. Eh, I'm trying to catch up. I have a bunch of little stuff that I've done over the past few months but haven't shared yet. So I'm going to throw them all at you in one big post. Last weekend our family attended a fun shindig, and what better gift do you take to a sweet sixteen party than a key fob?? 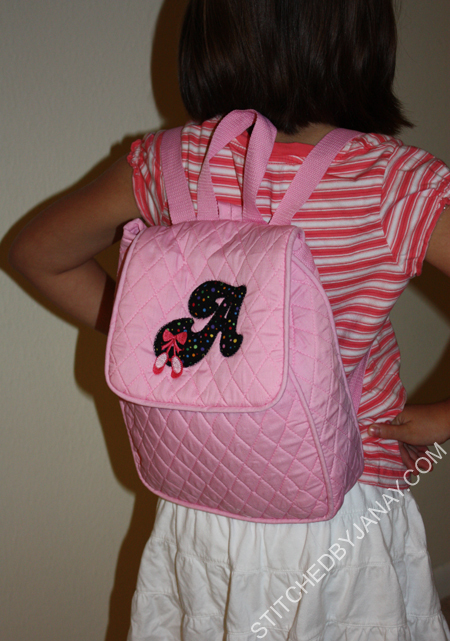 It also makes an awesome gift for Annaliese's teacher, whose birthday was this week. 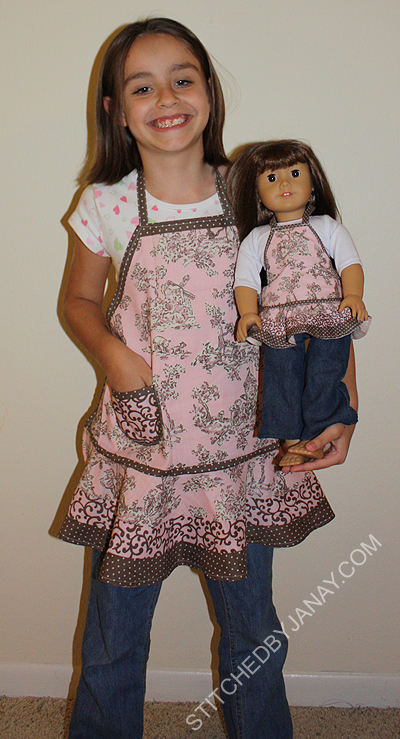 And finally my big project of the week... 10 more aprons like the ones I made earlier in the summer. 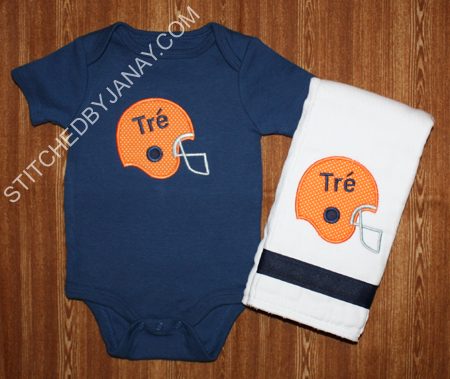 In this case (since it was an order and not a gift) I did not use the licensed fabric, but simply used orange and navy. 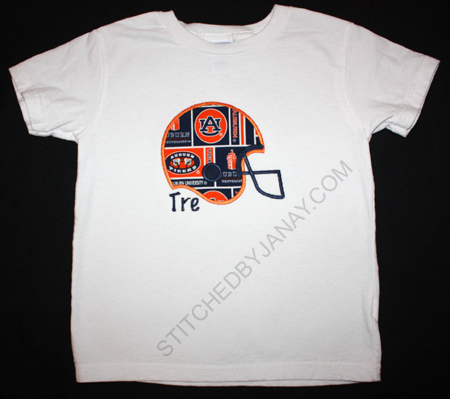 I used Lynnie Pinnie's applique football helmet design, and added his name with Embird Alphabet #2. 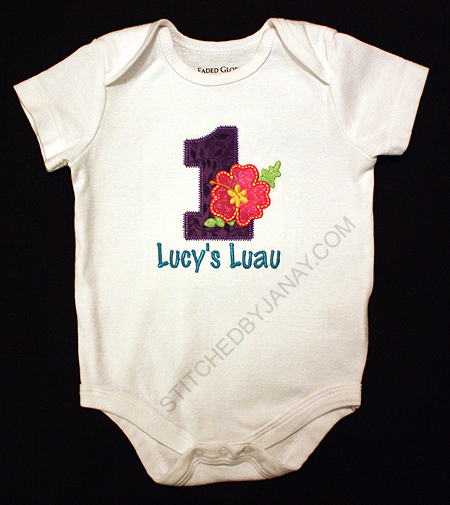 Initially I thought about using Planet Applique's Tiki Alphabet, but the 1 was so skinny that I didn't like it. 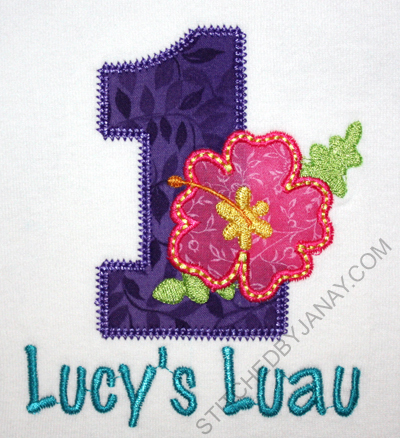 So I used my fave Chubby Wubby Applique Numbers from GG Designs, and merged the hibiscus from the Tiki Alphabet onto GG's 1. I added the text with Embird Alphabet #8. 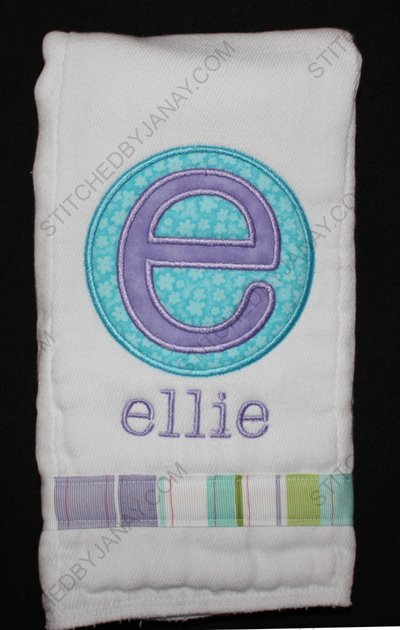 Michelle requested this design and color scheme for a burp cloth as a baby gift. I love it when she does all the planning for me! 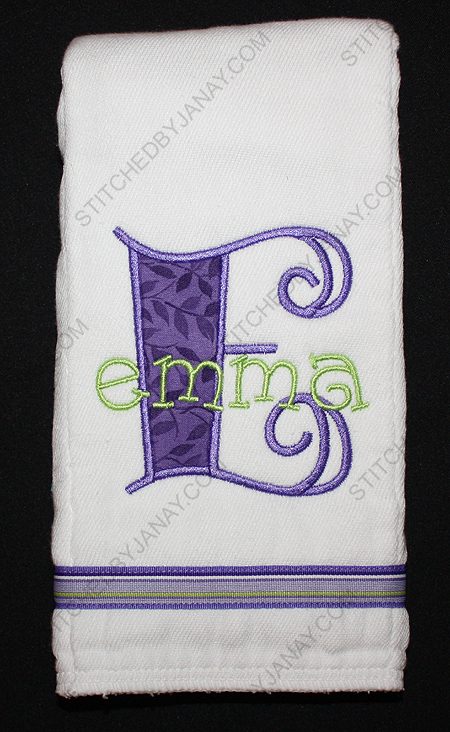 The Taylor applique monogram is from Lynnie Pinnie. 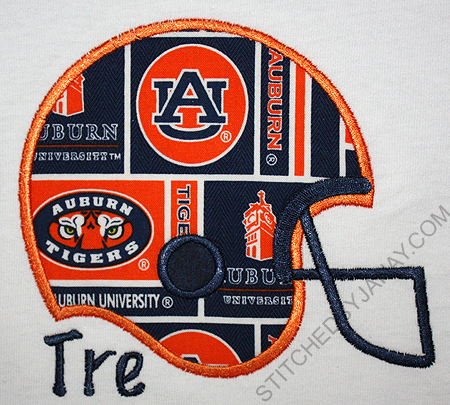 I used Lynnie Pinnie's new applique football helmet design, and added his name with Embird Alphabet #8.